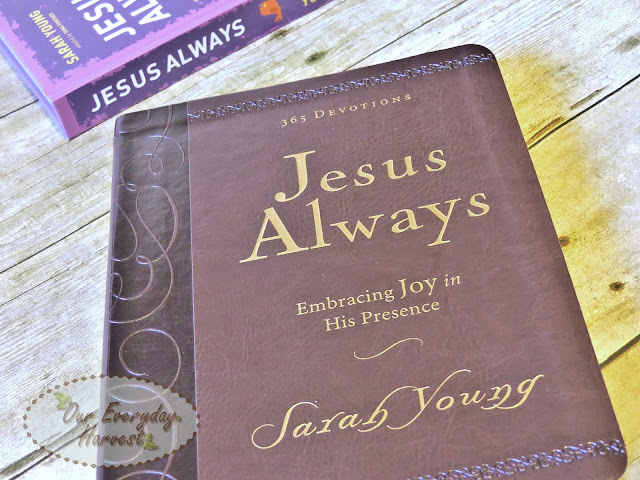 I was first introduced to the work of Sarah Young back in 2015 when I had the opportunity to read all of the devotional books in her Jesus Calling Collection, these included the original Jesus Calling, as well as the children's versions such as Jesus Calling 365 Devotions for Kids and Jesus Calling for Little Ones. Between the original and the children's versions, my son and I have enjoyed these books immensely. Needless to say, the following year I was sure to pick up Jesus Today Devotions for Kids. What really moved me about these books is that they're all worded as if Jesus is speaking directly to the reader. I can't begin to express the emotions that I felt while reading these devotionals. 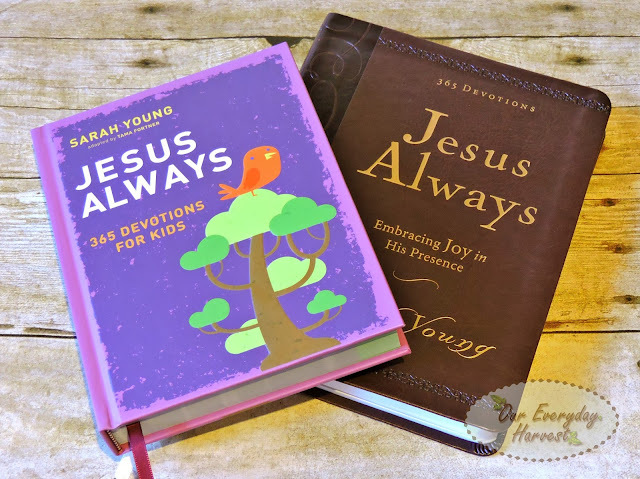 When I recently received the news that Ms. Young had released two additional books in what I personally like to call the "Jesus Devotional Series," I was beyond elated and knew I had to pick both of them up for our daily reflection in His word. Jesus Always is the newest devotional, and like Jesus Calling and Jesus Today, there are both adult and children's versions. Reflect on the joy that can be yours because of Jesus in Jesus Always Large Deluxe, bestselling author Sarah Young’s first 365-day devotional since Jesus Calling®, now available in large deluxe binding with Scripture written out, large Comfort Print™ text, and a beautiful leathersoft cover. Experience true joy—now and always. In Sarah Young’s newest 365-day devotional for kids, Jesus Always: 365 Devotions for Kids, she focuses on the biblical teaching of the joy we can experience at any time and in all circumstances. With Scripture and new personal reflections, the #1 bestselling author brings Jesus’ message of joy—for today and every day—to children. Adapted from the bestselling Jesus Always, each day’s devotion has the same theme as the adult version, as well as written-out Scriptures. It is a great choice for families to read and discuss during devotional time together. 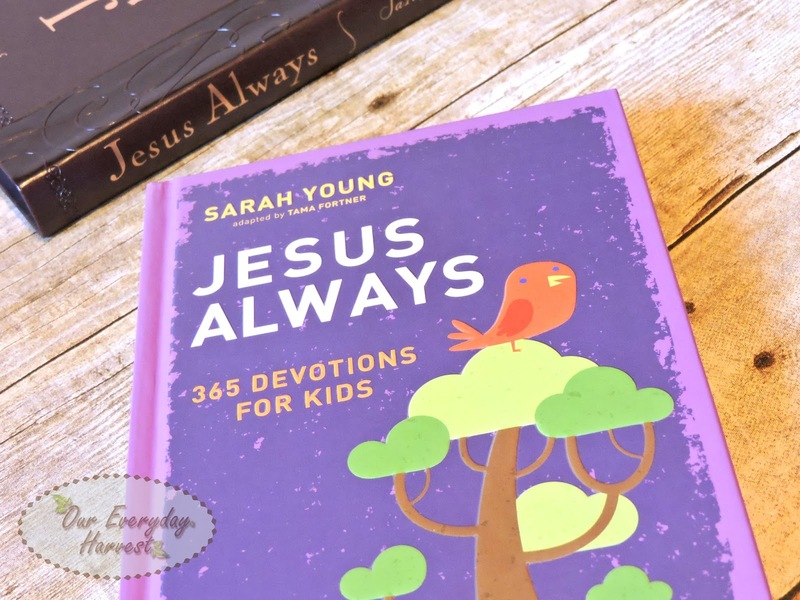 Written as if Jesus Himself is speaking directly to the reader, Jesus Always: 365 Devotions for Kids will engage your children and help them find lifelong true contentment and joy. Sarah Young, the author of the new 365-day devotional Jesus Always and bestselling Jesus Calling®, has sold more than 20 million books worldwide. Jesus Calling® has appeared on all major bestseller lists. Sarah’s writings include Jesus Calling®, Jesus Today™, Jesus Lives™, Dear Jesus, Jesus Calling® for Little Ones, Jesus Calling® Bible Storybook, Jesus Calling®: 365 Devotions for Kids, and Peace in His Presence, each encouraging readers in their journey toward intimacy with Christ. Sarah and her husband were missionaries in Japan and Australia for many years. They currently live in the United States. When I am in my quiet time with the Lord, it's not usually difficult for me to hear Him speaking to me. There's nothing that can replace that feeling that comes upon us when we get that extra one on one time with Him. Most of the time, it's a word that's both personal and meaningful to us and us, alone. It could be in reference to a hurdle that we're trying to overcome, or some other aspect of our lives where He may be guiding us with His voice. With that being said, devotionals like Jesus Always offer such a comfort that comes in addition to those personal messages that He gives us in our quiet time with Him. My savior is everything to me, He gives me life, and I want Him to be everything to my son, as well. Having a version of this devotional specifically made to speak to him is extremely important. Since my son is quite young and not reading on his own at the moment, we sit and read Jesus Always 365 Devotions for Kids together. It's also important to note that the daily devotions included in the children's version actually parallel the adult version. So if you have an older child who enjoys reading devotionals on their own, you could use this as an invitation for further discussion afterwards, where the child reads their daily word and the parent reads theirs. Later on, both of them can further reflect on the word together as a family. I know this is something I plan on doing with my son when he gets a bit older. I love that the author has done this. I think it's a brilliant way to bring family together for Bible and devotional study time. As far as aesthetics, both books are beautiful. Each of them are purple to show that they are part of the same collection. This follows suite with both the Jesus Always (orange) and Jesus Today (blue) books where both the adult and children's version were color coded to match each other. 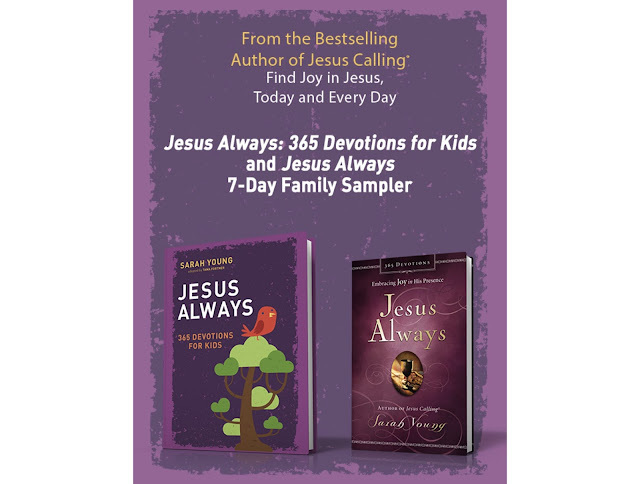 Jesus Always 365 Devotions for Kids has a hardcover exterior with glossy interior pages. There are some graphic embellishments, but for the most part, the book is all about the text. As for the adult version, I currently own the hardcover version of the previous two books, but this time I received the deluxe Comfort Print edition, which offers a leathersoft cover that is so elegant and beautiful! It has gold writing on the front and decorative impressions on the spine, as well as the front and back cover. I do most of my reading at night under a lamp, and one of my favorite features about this version is that it also contains extra large type, which makes it so much easier to read. In addition to the different exteriors of both books, there are a few other variations. 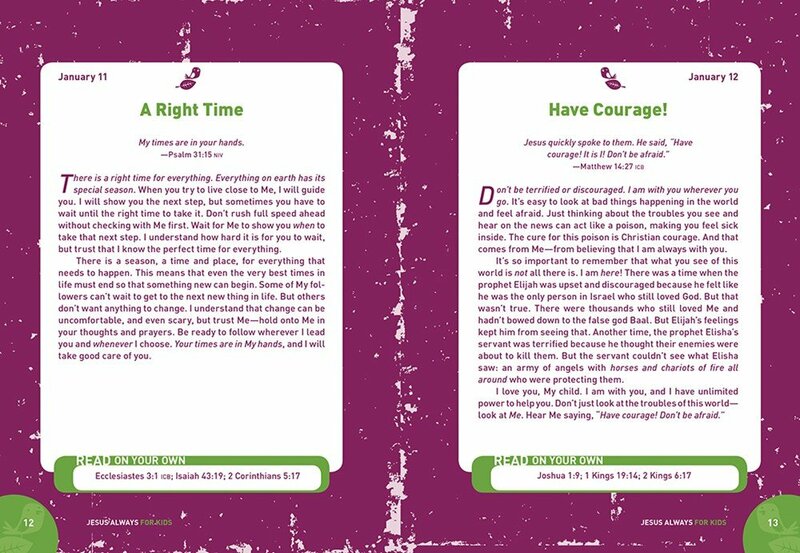 While they are both yearly devotionals that begin with January 1st and end with December 31st, they each present a different layout. The adult version of Jesus Always begins with the daily entry, followed by three to four scripture verses for further reflection. The children's devotional, actually starts each devotion with one scripture reference to reflect on, and then moves on to the actual message of the day. Kids will then be directed to a Read On Your Own section, underneath each daily entry. This area references several related Bible verse chapters that they can look up on their own. While these variations are personally not a huge deal for me, I felt that they were worth mentioning. I like when everything is already included in the actual devotional, so I don't have to dig for the rest of the word, but I think it's nice that the children's version challenges kids to dig deeper, which actually helps them practice how to search for scripture in the Bible. I can't say that I'm surprised that we're enjoying both Jesus Always and Jesus Always 365 Devotions for Kids. Honestly, I didn't expect anything less, given the fact that we've enjoyed Sarah Young's previous devotionals. If you are looking for a good devotional that speaks from the perspective of Jesus, then this is definitely one that you'll want to read. If you have children, then I also recommend picking up the kid's version for them, as well. Both books definitely serve up the perfect opportunity to dive deeper into Jesus' love and promise.